GEORGE TOWN, March 10 — Located on the boundary of George Town and the buffer zone of the Unesco world heritage site, Sia Boey is poised to be the city’s very own Central Park. The former busy marketplace, which was vacated back in 2004, will soon be transformed into a RM5 million urban park surrounded by mature canopy trees with a pristine canal running through it. The market hall which dates back to the 1880s, along with its concrete tables used by previous market traders, will be restored and turned into an event space. The once-brackish canal, formerly known as the Prangin Canal, has already been rehabilitated and restored into a pristine waterway with fish swimming in it. In about six months’ time, approximately 2.62 acres of the entire 5.45-acre site will be a public green space in the middle of the city. BYG Architecture Sdn Bhd director Michael Ong said mature canopy trees will be planted to provide shade for the park and keep it cool enough for people to rest under. “We don’t have a proper park in George Town and this space is perfect for a park, for people to rest, go for walks and enjoy the greenery,” he told Malay Mail. BYG, which is Sia Boey Urban Park’s lead project consultant, will be creating the park and restoring the existing 22 shophouses at the site. “Our concept is to make sure it is a recreational park for the community, with a playground for children, and it will make the city a liveable city,” Ong said. There will also be a walking path that meanders through the park and loop around the canal. He said the park will go very well with the Penang Island City Council’s (MBPP) vision to repopulate George Town with public amenities to draw people back to the city. Sia Boey began life as a trading hub back in 1804. At that time, small vessels could bring goods into George Town through its canal. As the trading hub evolved, the cast-iron market hall and a drinking fountain were built in the mid-1880s while the canal was narrowed in the 1900s. Since then, the site — known as Sia Boey by the local Hokkiens or Ujong Pasir by the Malays — remained a busy marketplace and meeting point for wholesalers in George Town until it was vacated. The canal was used as a dumping ground by market traders over the years and became a viscous waterway that emitted a strong foul odour. In 2004, the site was vacated, the traders and tenants evicted by landowner Penang Development Corporation (PDC) to make way for the Komtar Phase V development project. The row of shophouses on the site along with the market hall were left to decay. The whole place became overgrown with vegetation, while the state government of the day proposed one project after another, which never took off, for the site. Ong said the plan is to fully restore the heritage buildings while still keeping most of the large ficus trees that have grown among the buildings. “We want to keep as many of the trees as possible to go with the whole park concept so we will strengthen the walls of the buildings when restoring them,” he said. The archaeological findings on the site — a police barracks and a basin with canal lock — will be integrated into the park. Ong said the base structure for the police barracks, dating back to the Straits Settlement era, will be left open to the public. However, parts of the basin with canal lock, which is a water-filled trench, will be covered up. According to George Town World Heritage Inc (GTWHI) general manager Ang Ming Chee, an archaeological advisory panel deliberated on the management and interpretation of the archaeological findings at the site. GTWHI, jointly with PDC, took over the management of the site in 2016 and came up with a Sia Boey Integrated Site Management Plan. Archaeological work and investigations on the structures and artefacts uncovered at the site were held between 2016 and 2017 while the earlier planned Komtar Phase V project was shelved. GTWHI officers desludged, cleaned up and collected thousands of artefacts from the canal before it was rehabilitated to its current pristine conditions. GTWHI built environment and monitoring officer in archaeology, Charlotte Papillaud Looram, and conservation architect Virajitha Chimalapati worked together to sieve and identify the thousands of artefacts dug up from the canal. “We found a variety of items from the canal; coins from various countries that dated back to the Qing Dynasty and the Straits Settlement, toys like marbles and spin tops, crockery, animal bones and a lot of rectangle erasers,” Looram said. GTWHI will soon be engaging with local communities to interpret and catalogue the artefacts retrieved from the canal. Ang said GTWHI handed over the project management of the site to BYG after it completed sifting through the debris and sludge dug up from the canal. In GTWHI’s site management plan, an LRT station will be based in a space adjoining the Sia Boey park, cutting across two dilapidated shophouses that stood alone on the site. 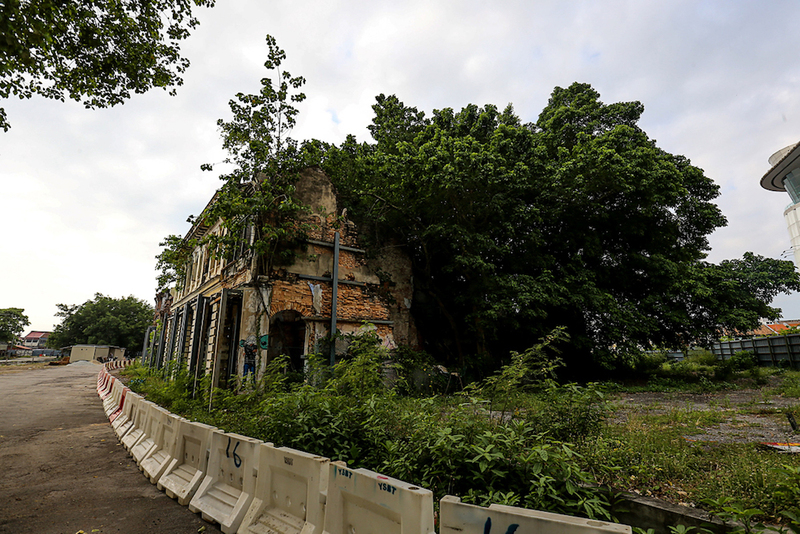 According to the proposal under the plan, the two shophouses, overgrown with trees, could be restored or strengthened while the LRT line could be built around and above it. It also proposed that the open space and green concept of the park be carried over to the LRT station design. The whole site is currently closed to the public and will only be open once the park is completed. Batu Kawan Uprising – Hot! Chosen as 3rd satellite city of Penang, Batu Kawan is ready for a rapid change in landscape. It's a golden nugget for property investors. A copy of informattion submitted will be sent out to your email.